Accounts Payable Representative performs the duties and functions required to process all bills, invoices, and expenses incurred by the company. 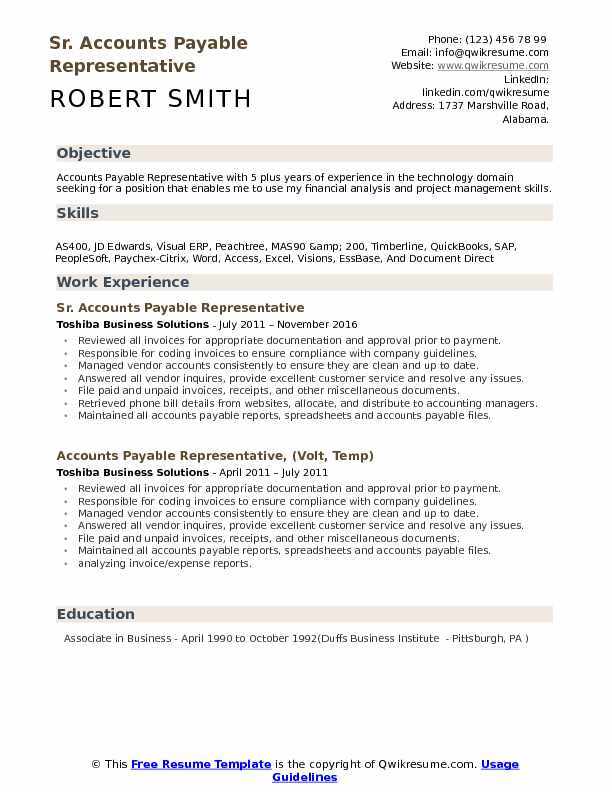 The underlined responsibilities of Accounts Payable Representative job description are paying the company bills, doing employee commission adjustments in a timely manner, verifying and paying vendor payments in a timely manner and reconciling all company payables to the balance sheet in a monthly basis. The responsibilities also include scanning all backup documents to appropriate files, upload check disbursements to the bank, help in audits and maintain both electronic and paper files in an up to date manner. 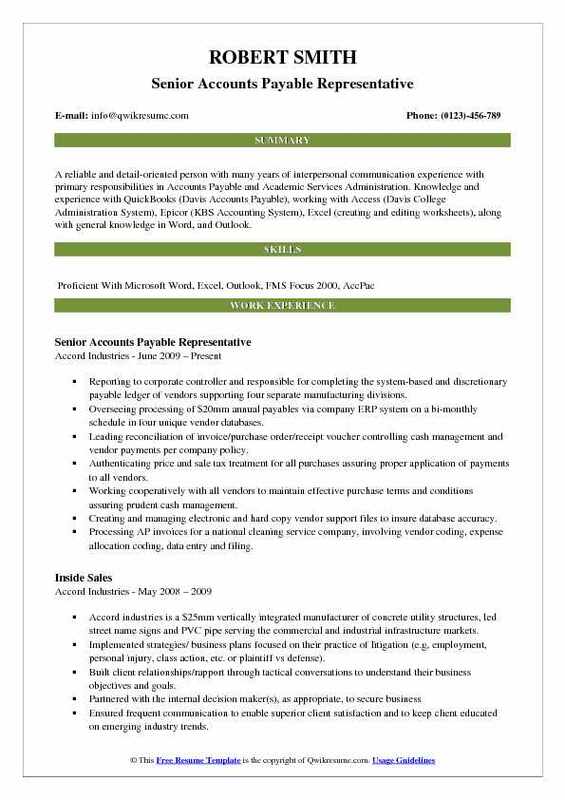 An Accounts Payable Representative Resume must showcase a minimum qualification of high school diploma or equivalent. The skills required are excellent data entry skills, proficiency in Microsoft office, creative, problem solving and decision-making skills. The individual should have a goal oriented and result driven approach and should be able to prioritize workload. Summary : Accounts Payable Representative I with 13 plus years of experience is seeking a career as an Accounts Payable Specialist with an organization that will allow me to utilize my accounts payable skills and room for advancement. Responsible for the full cycle invoice process for suppliers of merchandise and services to Tiffany & Co., reconciling vendor statements as well as providing exceptional customer service. Managing invoice processing of over 900 vendor profiles across 31 business units for finished goods, gemstone and diamond suppliers as well as non-purchase order related vendors spanning 3 continents. Gained a fundamental understanding of purchase order receipt and invoicing process of inter-company diamond and polishing entities through effective utilization of JDE and DAS systems. Implementing improvements that will result in drastic reduction in accounts receivable and payable aging variances for polishing entity from an average of 13 days to less than 3 days. Actively participating in the JDE 9. 1 upgrade process by testing and executing assigned scripts within given deadlines. Satisfactorily soliciting 60% of the companys top 100 check vendors from the previous financial year to switch to ach/ direct deposit. Communicating effectively and managing to help in consolidation of invoices for 10 of the top 25 suppliers by PO volume from the previous financial year thus reducing departments invoice volume. Collaborating meaningfully with application information services in the second quarter of the fiscal year 2017 to add a critical report to the accounts payable jde applications menu that resulted in major improvement of invoice processing turnaround of the inter-company polishing entity. Effortlessly able to navigate Aribas procure to pay management platform with the ability to address invoice related concerns ranging from addressing error queue items. Quick pay and reconciliation of Ariba versus JDE invoice entries. 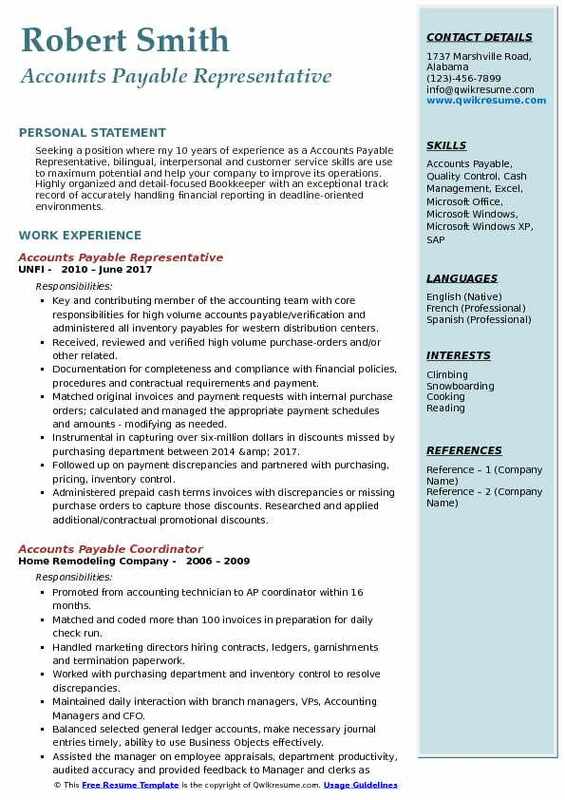 Summary : Dependable, motivated and reliable individual pursuing a successful career of 11 plus years as a Accounts Payable Representative in the Manufacturing domain in a company or organization that utilizes accounting and customer service expertise. Detail-oriented and resourceful in completing projects; and able to multi-task effectively. Independently processed all payables, high volume of invoices for a manufacturer of industrial controls. Disbursed all A/P checks averaging $500k to $1m monthly, with a high of $2m during high production. Matched invoices to packing lists, gl coded, entered data, verified P. O. Pricing, adjusted if incorrect. Verified invoices were authorized purchases, investigated discrepancies, resolved or reported to the controller. Ran cash requirement report, selected payments, submitted to the controller, ran the pre-check report. Pulled invoices, ran checks, posted, obtained signatures, secured checks, took a/p checks to post office. Created access databases to maintain vendor & a/p files, created databases for other depts. As needed. Answered vendor inquiries, maintained current information, & processed monthly statements. Supported company engineers, supplying component costs, serial numbers & details of prior job costs. Assisted auditors with yearly internal audit, assisted with phones, administrative duties, travel & as needed. Summary : Results- oriented Accounts Payable Representative II that has financial capabilities, along with over 19 years of efficient accounting and administrative skills. Proficient in accounts payable and can enter up to 500 invoices daily with experience with assisting with reconciliations and month- end close. Skills : Microsoft Office - Word and Excel, Oracle Financial Systems (11.5), MiBAS Web Module, Great Plains 170, Imaging System, MRO and Travel Expenses, WordPerfect M3. Accounted for matching, batching, coding, entry of A/P invoices and journal entries. Cut checks and issued payments to vendors through the company general ledger system. Researched and responded to inquiries (internal and external) regarding invoice status. Analyzed and reviewed vendor statements and reconciled account discrepancies with vendors. Verified payment information prior to releasing transactions for payment and maintained vendor files. Audited and appropriately coded expense reports in compliance with expense reimbursement policy. Contributed with weekly cash flow reporting, payment schedules, and payables. Incorporated into new software migration process, ultimately becoming the member of firms support team. Reduced vendor complaints by 40% within first six months of tenure by timely interaction. Rebuilt trust with vendors, repaired damaged relationships by ensuring timely, promised payments. 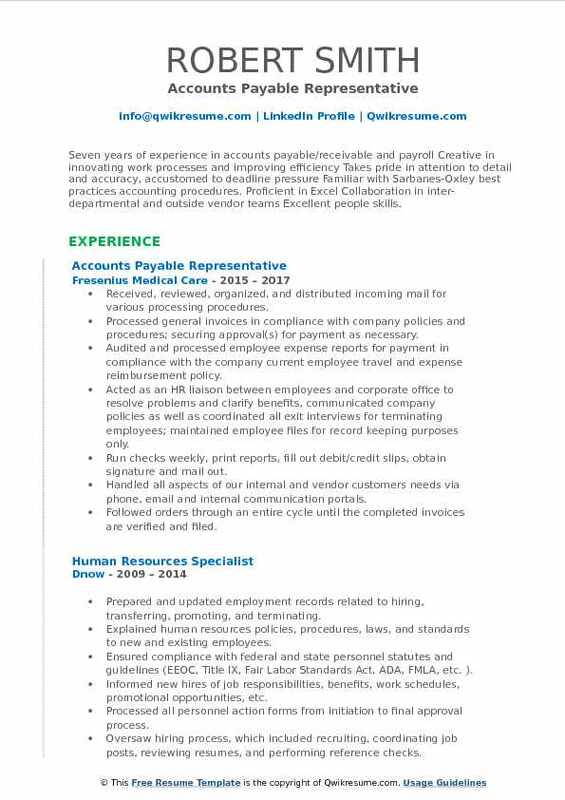 Objective : To obtain a position where I can employ acquired Accounts Payable Representative clerical skills in the Healthcare domain and provide efficient and effective administrative support in the areas of Customer Service and Administrative Operations. Used Microsoft Dynamics GP 2013/Great Plains daily to match invoices against purchase orders. Monitored accounts payable email box, print invoices, answer vendor questions. Used MS SharePoint and Great Plains 2013 to process expense reports weekly. Created process to find import errors before building check batch in great plains. As AP lead created a method to provide copies of 400 invoices for sales tax audit. Began using Oracle/PeopleSoft for invoice inquiry, use % wildcard character, and query view. Determined which vendors required a form 1099 and printed the forms. Generated trial balance reports in order to collect information for journal entries. Follow-up skills led to a $49,000 refund of 26 outstanding credit memos from one vendor. 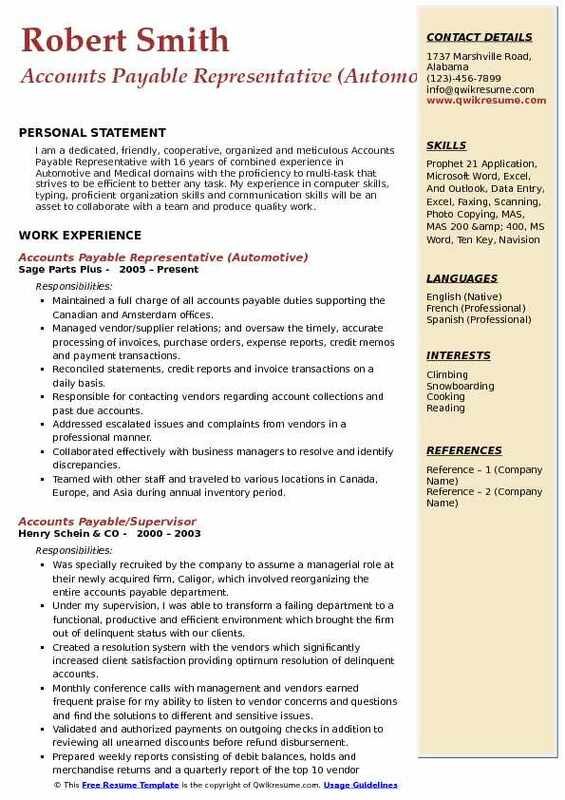 Summary : Seeking a position where my 10 years of experience as a Accounts Payable Representative, bilingual, interpersonal and customer service skills are use to maximum potential and help your company to improve its operations. Highly organized and detail-focused Bookkeeper with an exceptional track record of accurately handling financial reporting in deadline-oriented environments. 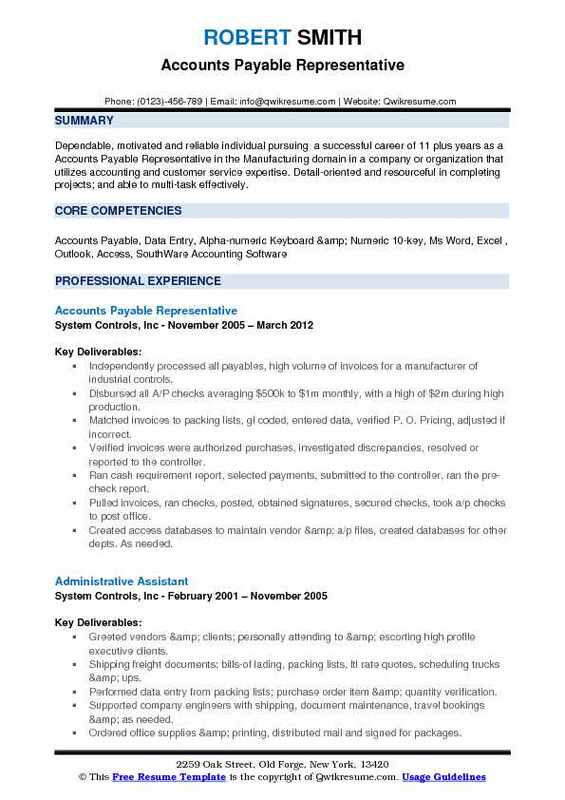 Key and contributing member of the accounting team with core responsibilities for high volume accounts payable/verification and administered all inventory payables for western distribution centers. Received, reviewed and verified high volume purchase-orders and/or other related. Documentation for completeness and compliance with financial policies, procedures and contractual requirements and payment. Matched original invoices and payment requests with internal purchase orders; calculated and managed the appropriate payment schedules and amounts - modifying as needed. Instrumental in capturing over six-million dollars in discounts missed by purchasing department between 2014 & 2017. Followed up on payment discrepancies and partnered with purchasing, pricing, inventory control. Administered prepaid cash terms invoices with discrepancies or missing purchase orders to capture those discounts. Researched and applied additional/contractual promotional discounts. Audited fellow employees captured promotions and reconciled monthly compliance reports. Objective : Highly efficient Junior Accounts Payable Representative with accounting skills, excellent organizational skills, prioritizing and administrative tasking abilities. Customer service driven experienced professional that knows the value of a good work ethic, teamwork and the ability to maintain confidentiality. Managed all aspects of research and invoice entry so that invoices were paid in a timely manner or within promised dates while working with and training 3 different co-workers in 18+ months. Printed and/or sorted, as well as routed invoices for 3 plants in the largest windows division, along with national windows accounts, it, engineering, and human resources. Processed over 3,500 invoices per month in the slow months and 5,500 per month during the busy months, with up to 25% being sent back with issues. Reconciled and brought current accounts from small to large vendors. High volume vendors had up to several hundred outstanding invoices at one time, with invoice dates up to 14 months old. Substantial interaction with vendors, buyers, and the plant controller to clear up quantity, pricing, and receiving issues on pos, especially older invoices with our highest volume vendors. Explained to new buyers ap processing when needed so PO invoices could be processed timely. Managed to reconcile invoices entered into an electronic invoice system and then removed 2 times. The first time invoices were being removed as I took over the division and managed to bring invoices to within 14 days in 4 months. 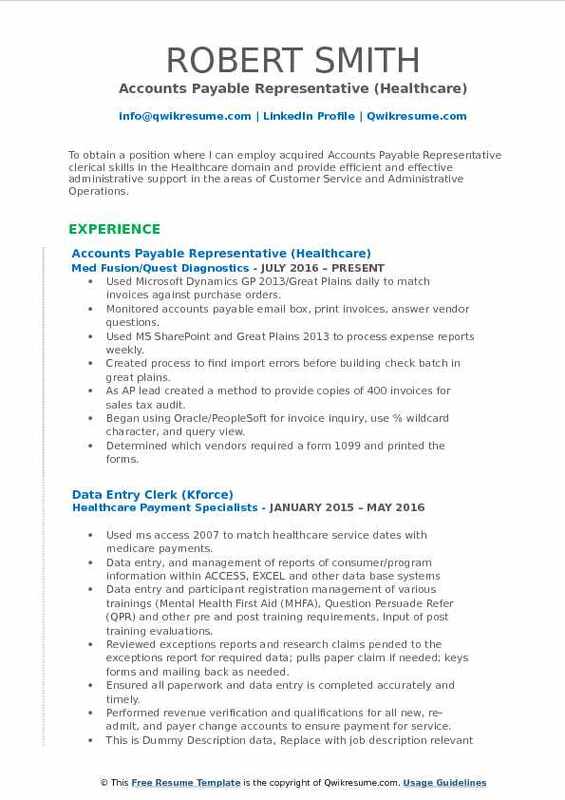 Summary : An accomplished health care professional who has 15 years of experience as a Senior Accounts Payable Representative in Patient care, held increasingly responsible positions in healthcare, customer service and revenue cycle environments. A strategic thinker and decision maker with the proven ability to achieve operational results and deal effectively with all levels of employees. Verification and coding of expense reports, international invoices and contract labor. Manual entry of payables, check requests, expense reports, production labor cards. Performing US and international payables in 2 different companies, 5 banks and 3 currencies. Consulting with programmers to create an automated e-mail database notifying application. Implemented a time saving process to track CM and RA numbers to debit memos. Converted all Euro and GBP payment vendors to comply with SEPA banking. 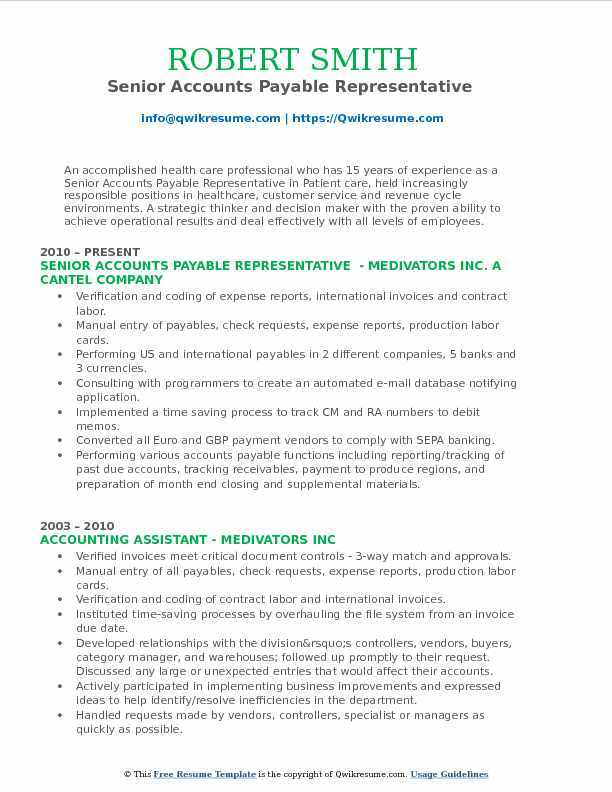 Performing various accounts payable functions including reporting/tracking of past due accounts, tracking receivables, payment to produce regions, and preparation of month end closing and supplemental materials. Communicating at multiple levels within customer accounts and internal departments. 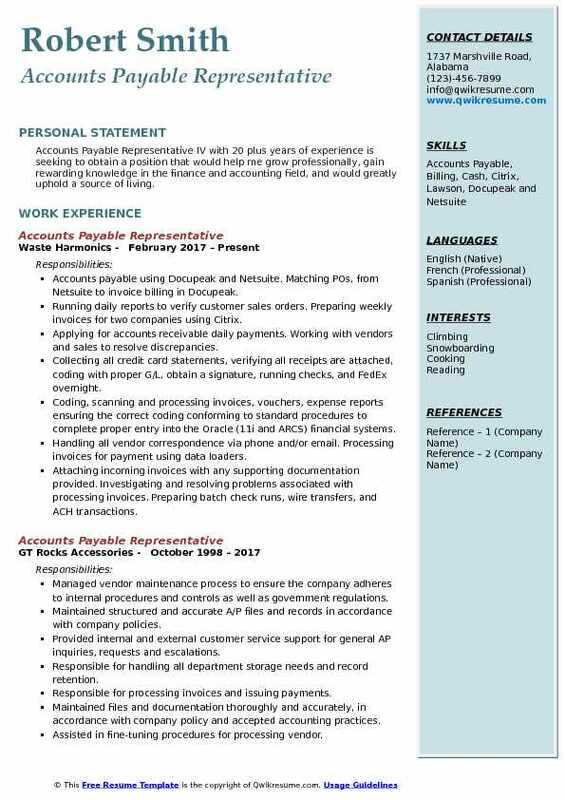 Summary : Accounts Payable Representative with 13 years of experience in Real estate domain is seeking a challenging position with growth potential where my accounting knowledge, lead experience and communication skills will be best used to provide value to my team and my company. Receiving, processing, verifying and reconciling incoming invoices to complete payment in a timely manner. Managing the coding of invoices, vouchers and check requests to ensure the proper information is entered into the financial system. Managing all incoming work/service orders ensuring all supporting documentation is attached to the appropriate invoices. Investigating and resolving any problems associated with processing invoices. 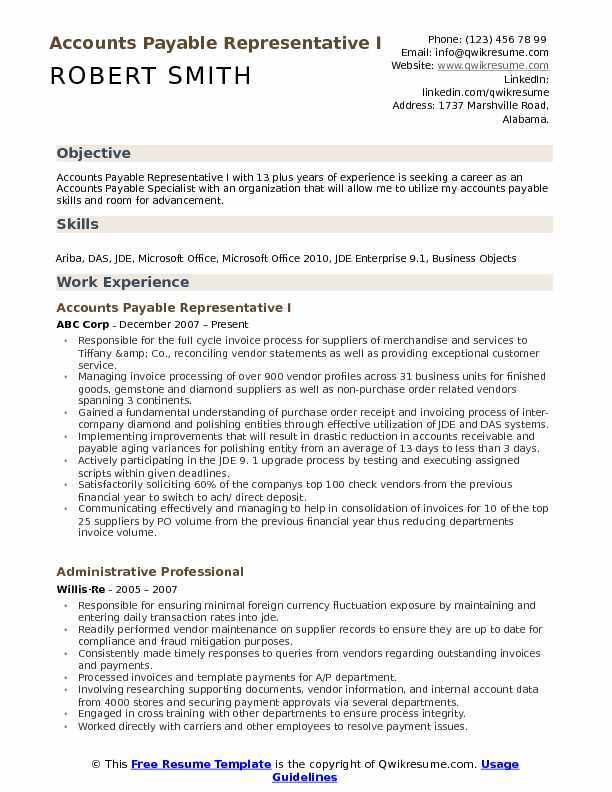 Accepting, researching and resolving a variety of routine internal and external inquiries concerning account status, including communicating the resolution of discrepancies to appropriate person or vendors. Filing, maintaining and distributing check runs, all accounting documents, records, and reports. Annually submitting the municipal reimbursement request to appropriate township entities. Reconciling credit memos against chargebacks and negotiated settlements. Summary : I am a dedicated, friendly, cooperative, organized and meticulous Accounts Payable Representative with 16 years of combined experience in Automotive and Medical domains with the proficiency to multi-task that strives to be efficient to better any task. My experience in computer skills, typing, proficient organization skills and communication skills will be an asset to collaborate with a team and produce quality work. Maintained a full charge of all accounts payable duties supporting the Canadian and Amsterdam offices. Managed vendor/supplier relations; and oversaw the timely, accurate processing of invoices, purchase orders, expense reports, credit memos and payment transactions. Reconciled statements, credit reports and invoice transactions on a daily basis. Responsible for contacting vendors regarding account collections and past due accounts. Addressed escalated issues and complaints from vendors in a professional manner. Collaborated effectively with business managers to resolve and identify discrepancies. Teamed with other staff and traveled to various locations in Canada, Europe, and Asia during annual inventory period. Reconciled vendor statements, researching shortage claims for returns from both vendors and stores, with the assistance of vendors websites. Submitted invoices for payment. Worked with vendors to resolve accounts payable discrepancies. Summary : Well organized, dependable Accounts Payable Representative III, team player with extensive and varied experience in office/bookkeeping functions. Work well under pressure and good at detail work. Preparing and keeping track of payment terms and vendor account reconciliation. Posting invoices to appropriate GL account and ensure that accounts balance with the purchase orders. Creating and maintaining necessary manual and computerized files and filing systems. Answering telephones, respond to inquiries, refer callers to appropriate party or take messages and serve as back up for when another AP clerk is out. Maintaining and keeping a log of 28 credit cards for several employees for the hospital, including fuel cards. Undertaking special accounting projects assigned by the director of accounting & finance. Processing of physician bi-weekly payroll and monthly on-call/medical directorship payments. Responsible for creating and monitoring eft payments for monthly payments. Preparing, processing, and distributing invoice and employee expense report payments on a recurring schedule and/or as requested. 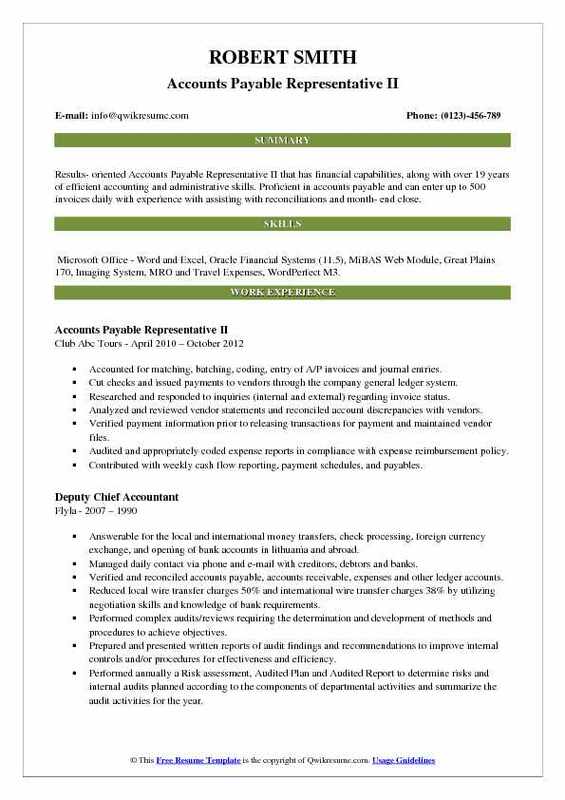 Headline : Accounts Payable Representative with 5 plus years of experience in the technology domain seeking for a position that enables me to use my financial analysis and project management skills. Reviewed all invoices for appropriate documentation and approval prior to payment. Responsible for coding invoices to ensure compliance with company guidelines. Managed vendor accounts consistently to ensure they are clean and up to date. Answered all vendor inquires, provide excellent customer service and resolve any issues. File paid and unpaid invoices, receipts, and other miscellaneous documents. Retrieved phone bill details from websites, allocate, and distribute to accounting managers. Maintained all accounts payable reports, spreadsheets and accounts payable files. Maintained applicable accounts payable files in adherence with the companys policies and procedures, and in compliance with irs statutes. 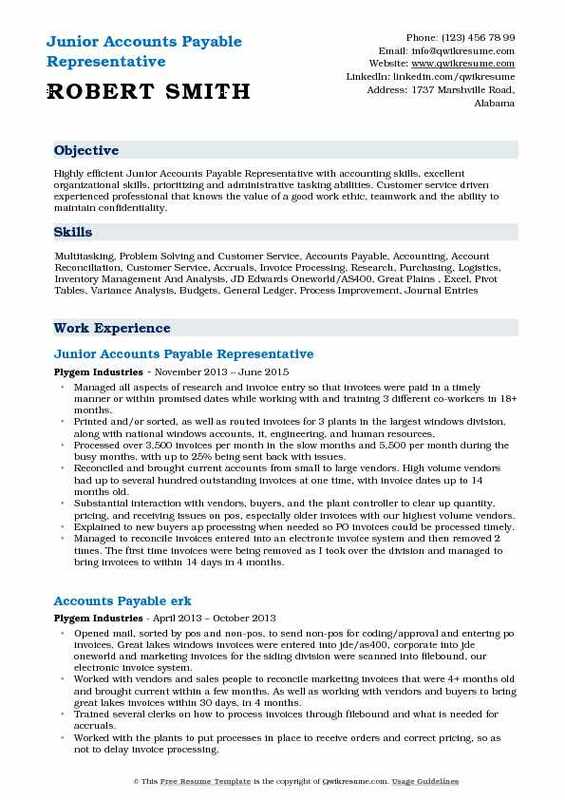 Summary : Stable, reliable, ethical and detail oriented Accounts Payable Representative with 11 years of experience in Aviation industry. Excellent communication and organizational skills to interact with all levels of personnel. Strong Interpersonal skills, particularly at building relationships. Skills : Microsoft Word, Excel, Window, Elite, Extensity, Oracle, Soloman, AS400, Data Bases, Outlook And Alpha And Numeric Data Entry. Issuing and tracking all purchase cards and travel cards following all the checks and balances. Running various detailed reports as needed, provide customer service with the card holders and the bank and problem solve issues with any of the cards. Making sure everything balances with the program cards before they are paid. 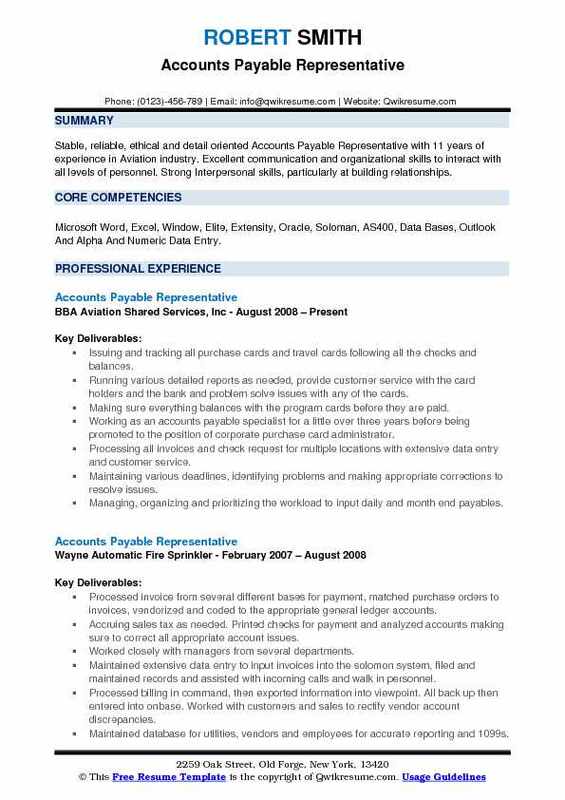 Working as an accounts payable specialist for a little over three years before being promoted to the position of corporate purchase card administrator. Processing all invoices and check request for multiple locations with extensive data entry and customer service. Maintaining various deadlines, identifying problems and making appropriate corrections to resolve issues. Managing, organizing and prioritizing the workload to input daily and month end payables. Creating and distributing settlement and invoice detailed reports for several locations. Maintaining professional communication and relationship with accounting personnel in the corporation, outer offices and vendors was very important to me. Summary : A reliable and detail-oriented person with many years of interpersonal communication experience with primary responsibilities in Accounts Payable and Academic Services Administration. Knowledge and experience with QuickBooks (Davis Accounts Payable), working with Access (Davis College Administration System), Epicor (KBS Accounting System), Excel (creating and editing worksheets), along with general knowledge in Word, and Outlook. Reporting to corporate controller and responsible for completing the system-based and discretionary payable ledger of vendors supporting four separate manufacturing divisions. Overseeing processing of $20mm annual payables via company ERP system on a bi-monthly schedule in four unique vendor databases. Leading reconciliation of invoice/purchase order/receipt voucher controlling cash management and vendor payments per company policy. Authenticating price and sale tax treatment for all purchases assuring proper application of payments to all vendors. Working cooperatively with all vendors to maintain effective purchase terms and conditions assuring prudent cash management. Creating and managing electronic and hard copy vendor support files to insure database accuracy. Processing AP invoices for a national cleaning service company, involving vendor coding, expense allocation coding, data entry and filing. Headline : Seven years of experience in accounts payable/receivable and payroll Creative in innovating work processes and improving efficiency Takes pride in attention to detail and accuracy, accustomed to deadline pressure Familiar with Sarbanes-Oxley best practices accounting procedures. Proficient in Excel Collaboration in inter-departmental and outside vendor teams Excellent people skills. Received, reviewed, organized, and distributed incoming mail for various processing procedures. Processed general invoices in compliance with company policies and procedures; securing approval(s) for payment as necessary. Audited and processed employee expense reports for payment in compliance with the company current employee travel and expense reimbursement policy. 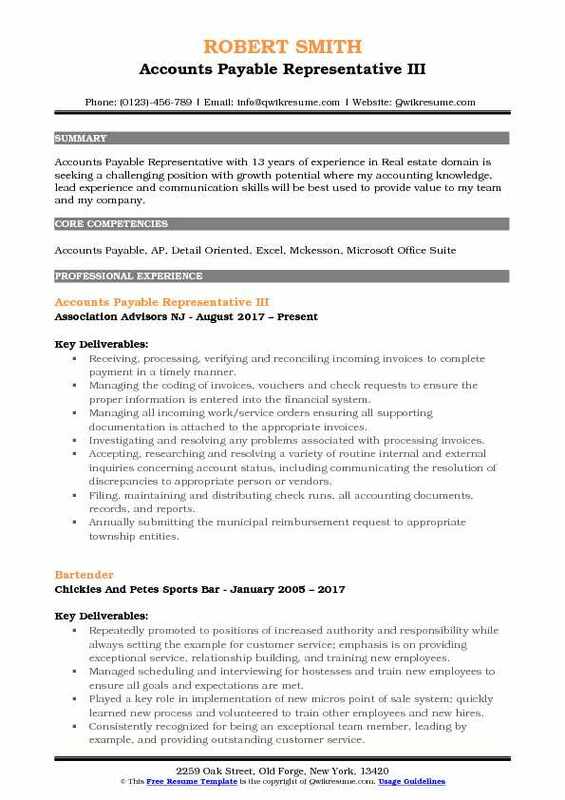 Acted as an HR liaison between employees and corporate office to resolve problems and clarify benefits, communicated company policies as well as coordinated all exit interviews for terminating employees; maintained employee files for record keeping purposes only. Run checks weekly, print reports, fill out debit/credit slips, obtain signature and mail out. Handled all aspects of our internal and vendor customers needs via phone, email and internal communication portals. Followed orders through an entire cycle until the completed invoices are verified and filed. 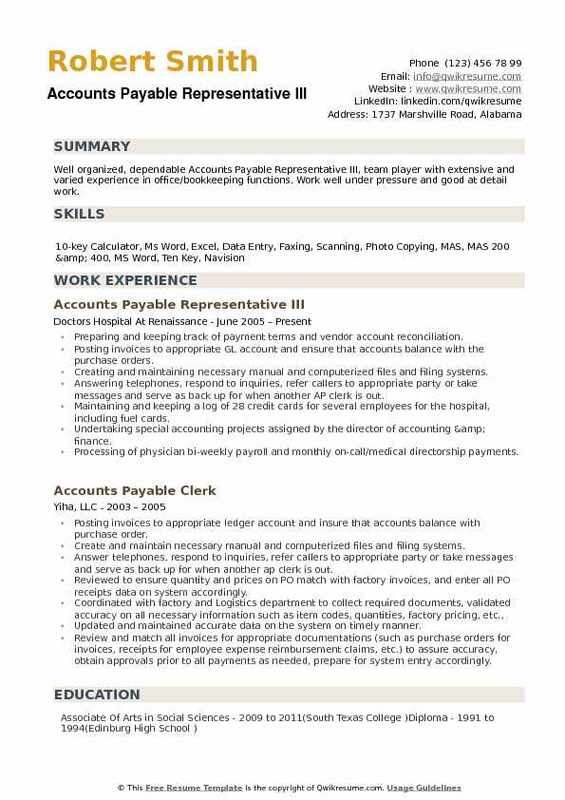 Summary : Accounts Payable Representative IV with 20 plus years of experience is seeking to obtain a position that would help me grow professionally, gain rewarding knowledge in the finance and accounting field, and would greatly uphold a source of living. Accounts payable using Docupeak and Netsuite. Matching POs, from Netsuite to invoice billing in Docupeak. Running daily reports to verify customer sales orders. Preparing weekly invoices for two companies using Citrix. Applying for accounts receivable daily payments. Working with vendors and sales to resolve discrepancies. Collecting all credit card statements, verifying all receipts are attached, coding with proper G/L, obtain a signature, running checks, and FedEx overnight. Coding, scanning and processing invoices, vouchers, expense reports ensuring the correct coding conforming to standard procedures to complete proper entry into the Oracle (11i and ARCS) financial systems. Handling all vendor correspondence via phone and/or email. Processing invoices for payment using data loaders. Attaching incoming invoices with any supporting documentation provided. Investigating and resolving problems associated with processing invoices. Preparing batch check runs, wire transfers, and ACH transactions. Receiving, researching and resolving a variety of internal and external inquiries concerning account status, including communicating the resolution of discrepancies to the appropriate people. Communicating with vendors and appropriate managers concerning payments and payment processing. Filing and maintaining accounting documents, records, and reports. Performing other duties as required to support accounting department. Developed a reference list of invoice categories for the departments use.